Unfortunatly the app got some bad comments from buyers, who obviously did not read the description and as a result expect other than found in the description below. 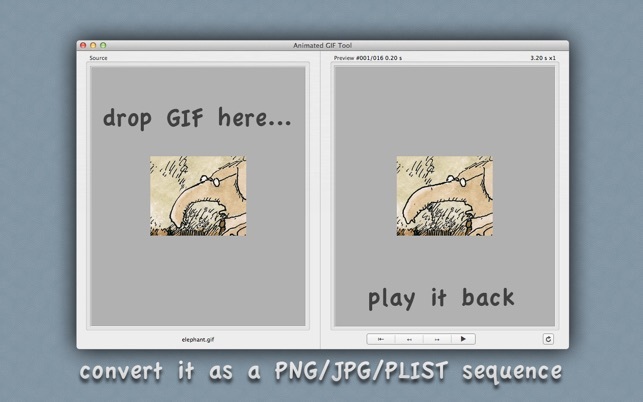 Here is where Animated GIF Tool kicks in. It takes a GIF file, extracts frame and loop count as well as each frames timing information and stores that in an easy to use Property List file. You can download the source files for SAAnimatedImageView, a ready to use subclass of UIImageView/NSImageView from the the Animated GIF Tool website. 2.You can then review and playback the file and the individual frame timings, playback in a loop, or step framewise forward and backward. So, you an see it claims to be able to do exactly what I wanted and expected it to do. When I open the program, I can drag&drop a GIF file into it BUT ALL IT DOES IS TO ALLOW ME TO PLAY THE GIF….NOTHING MORE. It DOES NOT allow me to see individual frames OF move them forward or backward in the sequence as claimed. the very things that it claims to do in very plain language. I hope to hear from the developer of this APP about this issue and I’ll report the results here. Thanks for your feedback. I am sorry to hear you are having problems with the Animated GIF Tool. I am very interested in examining GIF files causing trouble. If you write to support@cocoala.com I will be happy to try fixing the problem. I have to say this is great! It does just what I needed. There is hardly any software out there to do this. I found one more here on app store but it was much more expensive. This is the right price. Thank you very much. I have been looking all over the place for something to do this quickly. The Plist maker was even an added bonus. Thanks for your positive feedback! I am always happy to find feedback of customers who actually read the description of an app before buying 😀.